Today is my mother’s birthday; she would have been sixty four this year. Computers are dumb, no matter how much we like to pretend otherwise, and some of the conveniences that programmers and device manufacturers have added to them have unintended consequences when we are faced with what is both catastrophic and inevitable. At fifteen minutes after midnight my iPhone suggested that I call my mother and wish her a happy birthday. The computer doesn’t know she’s dead, but the people who made it somehow didn’t anticipate this very human development, nor, apparently, that I’d be unwilling to remove her entry from my address book, or at least unwilling to do so after only six months. The relentless stupidity of technologists in the face of how our lives are actually lived continues to amaze me. Their vision of how technology can fit into our lives is a good one if you’re wealthy, if you’re white, if you’re straight, if you never get sick or weaken or if no one dies or leaves you, or if you never have anything to fear from another person. Nothing they make ever works as advertised and yet they never think to build with failure states in mind. It’s not the worst I’ve felt this week, not even the worst I’ve felt so far today, but it does make me want to wring some software engineer’s neck. I realized last night that I still had three voicemails from my mother. I’m the sort of person who usually deletes voicemails right away, so I hadn’t even bothered to look before. It turns out that the iPhone saves some voicemails for however long, even after you’ve deleted them—that’s where I found these, among my deleted voicemails. One of the messages was from last April, another from last January, and the third from December 2017. The iPhone also allows you to save copies of voicemails to your phone, to the cloud, or to your desktop computer. We didn’t have camcorders or anything like that when I was growing up. I have a lot of photographs of my mother, but no recordings other than these, which I saved to safer locations last night. It’s the first time I’ve heard her voice in more than six months. I suppose the software engineers might be good for something after all. Warren and I went to see the Blue Jays on opening day this year. I’d never been to an opening day game before. It wasn’t much different from any other game, except the pot for the 50/50 draw accumulates all weekend and they were pretty desperate to give away prizes between innings. The game was dismal (Marcus Stroman seemed to throw nothing but balls, and it was sheer dumb luck that kept the Detroit Tigers from completely annihilating the Blue Jays), but it’s always good to see Warren, and for the most part I had fun. I even spilled mustard on my jersey, which is a kind of unofficial (and always inadvertent) ballpark tradition for me. I found myself wondering if I should have worn my mother’s jersey to the game. She’d become an avid baseball fan in her last years, and her favourite player was Roberto Osuna, before it came out that he assaulted his girlfriend, and I’d given her a jersey with his name on it. She’d always wanted to go see a Blue Jays game in person, but never made it, for a variety of reasons. I’d feel sketchy wearing an Osuna jersey into the ballpark, but I also feel tremendously bad—guilty, even, though it’s not in any way my fault—that she never made it to a game herself, and part of me feels like if I’d worn her jersey instead of my own it might have gotten her at least partway there. I used to text her from the ballpark, and I had to stop myself several times, not really realizing what it was doing until I already had the phone out. It’s going to be a difficult year for watching baseball, although baseball is only the tip of the iceberg. When my mother died last fall one of the biggest layers to my grief involved all the things my mother hadn’t gotten to do in her life, and her not seeing a baseball game in person struck me in some way as the most heartbreaking, because it would have been one of the easiest ones to make happen. She never saw my new apartment, never met my new cat, never got to spill mustard from a ballpark hotdog on her jersey. This situation is going to keep coming up, and while I knew to expect this one, I know that others are going to catch me by surprise. 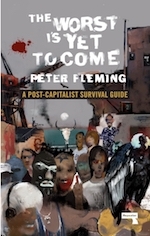 I recently picked up The Worst Is Yet to Come, by Peter Fleming, because apparently all I read now are books recommended by Warren Ellis. Fleming tackles the imminent collapse of neoliberal capitalism with a truly fantastic combination of deep scholarship and wicked, angry humour. This is the sort of thing that we’re all supposed to pretend Spider Jerusalem was writing in Transmetropolitan. Fleming’s book introduced me to the concept of “Revolutionary Pessimism,” which embraces pessimism but denies nihilism: “Revolutionary pessimism anticipates the nastiest surprises that a derailed civilization has to offer, yet refuses the cult of futility,” writes Fleming. I find this idea intriguing, because it allows us to acknowledge the true severity of a situation, be it income inequality or climate change, without becoming paralyzed by it. It reminds me of a famous line from Pirkei Avot (Ethics of Our Fathers): “You are not obligated to complete the work, but neither are you free to desist from it.” It’s pessimistic to say “we aren’t going to be able to fix this,” but revolutionary pessimism demands we attempt radical, revolutionary solutions regardless. The only real downside is that Repeater Books did a horrible job on the copyediting; there were a large number of errors and some extremely strange decisions more generally.